There are two kinds of parenting approaches: Yours, and everyone else's. There are reasonable parents who set boundaries and give love (like you), and then there's the crazies: the hippies, Tiger moms and assorted nutjobs who fill us with the warm glow of self-righteousness. Lucky us: The latter now have a reality show. Bravo Media gives a candid and unfiltered look into some of the unique and unconventional styles of raising children in the upcoming docu-series, Extreme Guide to Parenting. From "conscious-attachment" and "helicopter" to "hypnosis" and "push-parenting," these moms and dads believe their parenting techniques are the best and everyone else is doing it wrong. Each hour-long episode showcases different households with alternative styles of raising their children. These people think THEY are right? And that I'm wrong?! I already hate them and I don't even know them! (Am I doing it right?) The thing is, how extreme this stuff all hits you kinda depends on the sort of parent you are, or might be — and probably depends a lot on where you buy your hormone-free grass-fed lamb with baby wrap included. So let's meet these freakshows and decide exactly how wrong they are, shall we? The Adlers are an "eco-kosher" and "all-natural" bunch, a lifestyle in which parents make a choice to feed their child only natural foods that come from the earth. Mom Shira also practices "aromatherapy," which is the use of fragrance to alter a person's behavior or mood and is commonly use in daily life before a person does anything. What, they're too good for hot dogs? Don't they love their children? Assholes. This happy trio practices the "all baby, all the time" method. It took this gay couple years to adopt their daughter and now they never, ever leave her side. The adventurous Whitacres live a nomadic lifestyle. This choice involves living in their car, moving from place to place and not following a traditional lifestyle. It includes often sleeping in a tent, living off of minimal belongings and experiencing new places every day. Someone call grandma, the water in the yurt is out again. Assholes. The Eisenberg brood practices "push parenting" in which parents push their child to be the best, often enrolling their child in multiple activities and never taking no for an answer. Oh god I might actually hate these people. It's working. Assholes. The Valencia parents want their children to be warriors: people who show aggressiveness and courage, know how to defend themselves. Warrior children do not complain about their punishments which often include physical activities like planks, pushups and wall sits. Ok now it's just getting depressing. These beautiful assholes. The Brooks matriarch wants her children to be "the complete package," meaning people possessing all elements to be successful in life, including brains, beauty, style, grace, leadership and talent. The Axness couple practices "conscious attachment" parenting which is an emotional and physical bond between parent and child in which parents do not let the child out of their sight. Common actions include co-sleeping, breastfeeding and baby-wearing. Well for one thing, you really can't let a baby out of your sight at first. Two, I hella woulda worn my baby if my baby could stand it. Three, we co-slept for nearly 3 years. But you wouldn't catch me dead in that wreath, so, assholes. This family practices "body positivity" parenting which involves being positive, proud, and accepting of one's body and having no or living without shame regarding one's physical form. Mom Lisa practices "hypno-parenting" or the use of hypnosis on children to help them behave, complete chores or study. The hypnosis aims to give children "a leg up" in the world. A leg up alright: One full-length, functional leg up of crazy. Assholes. Obviously I am mostly kidding. But your reaction to these families (and mine, too) is a litmus test, not just for your parenting style, but your comfort level. Indeed, whether you find this stuff extreme at all is pretty telling. Bravo has provided a handy Extreme Guide to Parenting glossary of terms, which inadvertently shows that the practices themselves don't sound that crazy. Aside from maybe elimination communication which is only practiced by people who don't have to work, a lot of these things are likely stuff you incorporate into parenting in some way or another. If anything, it's the overall approach that makes it seem weird, not the intention or idea behind it. For instance: Lots of people wear their babies! That's not extreme! It keeps many infants calm and allows maximum bonding while mom or dad does other stuff, to say nothing of how it can facilitate nursing. Body positivity is a valid goal! Of course you don't want to shame your kid into hating their body! I would like to be the complete package! Who wouldn't! Gender neutrality is an admirable practice! Eating the placenta, while not my favorite postpartum activity, is not harmful to anyone! If people want to be weird hippies and do stuff that doesn't endanger anyone, have at! I have no idea what hypnoparenting is, but yeah, ok, sounds weird, but only because I don't know about it! Also, um, what? I want to break down old paradigms! When The Masterson-Horns hesitate to let baby Simone stay with Nana for an overnight, their friends tell them they are flat-out crazy. Nana is the most nurturing person they know, and she's just down the street, a friend insists. But the new parents are just not all that comfortable with sending the kid to a place that isn't baby-proofed or as secure. And while that might sound ridiculous, it's not an uncommon fear (new parent syndrome? Yes. Extreme? No). Basically, the series brings the voyeurism of "Hoarders" to the more relatable if imprecise art of raising children, introducing families whose good intentions place them on the fringes of what even the most diligent parents might consider normal. Still, such extremes are out there, and the series is riveting in a way, if slightly uncomfortable when contemplating that the kids have been innocently drawn into an entertainment that invariably sets up their parents as objects of curiosity and derision. 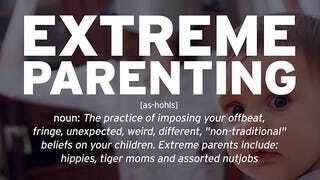 I"ll admit, living in Cali has definitely skewed my idea of what is normal vs. extreme (hippie parenting is not new — hypnoparenting, perhaps.) And there are, of course, reasons for viewers to feel valid anger (a woman refusing to vaccinate) and reasons for valid concern (the odds of this turning out great for the children involved feels about as likely as the Adler kids getting a pizza night) but mostly, just reasons for lots of unchecked scoffing in the privacy of your own home. Which is the whole point.